I had a bit of a job working out this recipe, which comes from my mother, since she really doesn't measure anything when she makes this! After some trial and error, I think these ingredient amounts work well. Cut the heads off the sardines. De-scale the sardines by running the blunt edge of a knife or an unused (and clean) plastic card down them at an angle; then make a slit down the belly side and remove the guts - or have the fishmonger do this for you if possible. Cut the tails off too if you wish; if the fish are quite large, cut them in 2 to 3 pieces each. Wash the sardines well under running water, and wipe well with paper towels. Put all the ingredients except for the fish in a pan that is large enough to hold the sardines in one layer. I use a large sauté pan for this. When the liquid has come to a boil, add the sardines. Lower the heat so that the liquid is just bubbling. Simmer slowly for about 20 minutes, turning the sardines over occasionally to coat them with the sauce. At this point, you can continue cooking the sardines for an additional 20 to 30 minutes, but the fish may fall apart a bit. If you want to preserve their appearance as in the photo, take the fish out with a slotted spatula, and cook the liquid down until it's syrupy. Add the fish back, and gently heat them through, coating with the sauce. Submitted by maki on 2010-03-14 02:44. Thank you for the recipe! I always see sardines at my favorite fish markets, but haven't been sure what to do with them..! This looks great. Finally, I made the sardines! Yum! I may have been impatient and cooked the sauce down at too high of a heat, because my glaze was much darker than yours. Also, I wasn't sure if I would want to eat the skin and bones -- and I did end up taking the larger backbone out as I was eating them -- but I ate one of them and realized I didn't really need to. Sooo oishi!!! It's Mother's day today in the UK, and my very first as a mother. I couldn't ask for a better gift than this recipe from yours. 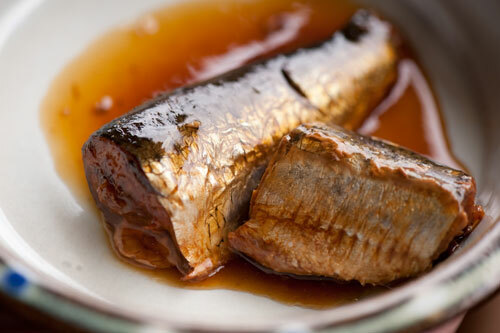 A perfect complement to her saba no miso recipe (I adore mackerel and sardines/pilchards). Iwashi are my obaachan's favourite fish and she often made this for me but I never got a recipe for much the same reason as you so thanks for being so observant and taking it down! Thanks to you and your mom for sharing this recipe. This is the kind of food I really miss from living in Japan. I've loved all the posts you've done with your mother's recipes--I hope she is doing well. It's great that you can share your love of food with each other. 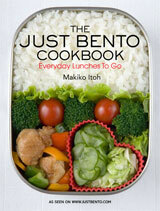 I stumbled on your sister site, just bento, about a month ago and am in love, love, love! Having grown up on the West coast of Canada, I am a huge Japanese food addict. Now that I'm living in England I have had to learn to make all the things I used to love to eat back home at restaurants; your site is my number one resource! One thing I would like to request is an article on how to store certain foods. Since I'm buying a lot of groceries that are new to my kitchen, and all the packaging tends to be in Japanese, I'm often unsure as to the best ways to keep things once I've opened them: how long, in what conditions, etc. Things like pre made inari skins, konnyaku and different kinds of pickles, sake and mirin, etc. are all things I've wondered about how best to keep. Hope you can help! Thanks for your lovely sites and all your hard work! Hi t, basically anything that is dry, or things like sake and mirin and soy sauce, can be kept in a pantry (not refrigerated); anything wet should be kept refrigerated or frozen, and used up as quickly as possible, after opening. Pickles will keep a bit longer. Packaged goods often have a date on them, which is usually the 'best by' date. I hope this means your mum is doing better? This looks lovely! can i tap on your knowledge to ask you about Japanese claypots. I will be going to Japan soon and would like to buy a good claypot. What are the different sorts - size/material/ glazed,unglazed? can they be used in the oven? are there any brands i should look out for? Should i go to the department stalls or to Kappabashi? Is there a difference between an average one and a really good and expensive one? I hope you can help me out because i would really like to get one and i'm afraid most instructions etc are in Japanese. Clay pots or donabe are usually unglazed on the bottom half and glazed on the top half (and the lid). They are meant to be used for rangetop or tabletop cooking, so they should be oven safe. Be careful not to subject them to sudden temperature changes (e.g. putting cold water in a very hot pot) or it may crack. The lid should have vent holes, be domed (not too flat) to allow air to circulate inside, and have a top lid that is high enough to grab comfortably with your hand (using a kitchen towel to protect your hand from the heat). Also, get a size that is big enough for the number of people you want to use it for. Tabletop donabe are shallower and wider then donabe meant for cooking rice in, so you may want to consider what you want to use the pot for. The price of donabe are largely influenced by the design and aesthetics. You'll pay a lot less for a mass-produced simple design vs. a hand-made one by a famous maker or ceramic artist, etc. Since they are usually used for tabletop cooking, aesthetics are rather important. As far as where to get one...you can go to Kappabashi if you want to (for the fun of it) but it's not necessary to do so. Any well stocked department store or a store like Tokyu Hands will have plenty of donabe to choose from, in all shapes and sizes. thanks so much for replying. I can't wait! Mmmm...sardines are tasty! Not only are they sustainable marine species, they are packed full of omega-3 essential fatty acids and protein! (BTW, do you know it's important to balance the omega-3 and omega-6 intake in your diet?) Thanks for the recipe, I'm going to try make my own. Fresh fish can be hard to get in the Midwest if you want anything at all "unusual," but I have used a recipe almost identical to this one with canned fish- tuna, salmon, mackerel, though I haven't tried sardines. Make the sauce, let it simmer until thick, then add the canned fish. Be sure to use "no salt added" fish if possible; if not, reduce the amount of soy sauce. Wow. I get fresh sardines here in SF and usually grille them portuguese style. They are so velvety and supple. I should try this out. A departure from portugal, but a pleasant landing into Japanese. I know this likely a dumb question, I use the dumb American card to excuse myself, but do you eat the outside scales of the fish? I'm sorry for asking, just I haven't heard of that before here. Sorry, I omitted the de-scaling part of the recipe. I have added it now. Your blog is my new love! I'm so happy to find variety of Japanese style home cooking. Hi Maki, I love the simplicity of this sardine dish, as it brings back cooking memories with my mother too. All very tasty and healthy treats.Thank you for sharing. Oh man, I found this recipe last summer, and only recently decided to try it. Sadly, I couldn't find any fresh sardines where I live in Maryland, so I made it with Spanish mackerel instead. I had to use a much larger skillet than is in any way reasonable. Holy Science this is a good recipe. Thank you - you are a lifesaver! Just wanted to express my heartfelt thanks for creating this wonderful site with so many fantastic recipes. I just moved to Nagoya with my husband and was thoroughly overwhelmed at the market - I had no idea what to do with any of the ingredients, but I was *not* going to wimp out and go to the international market to get expensive American foods! Your website has literally been a lifesaver and has allowed us to eat fresh, healthy Japanese food every day (and save money, too!). I also pack bentos for us each morning, so we're actually enjoying two of your recipes every day. Don't know what I would have done without this site. I made this sardine glaze last night but used it with a mackerel fillet instead, which came out fantastic. Both the saba and the sanma earlier in the week were very successful experiments for me, thanks to your guidance. Without your recipes, I wouldn't have had the courage to try fish I didn't recognize! So thank you, thank you, thank you, and keep up the wonderful work. You are helping people all around the world in ways you probably don't even know. Thanks for making Japanese food and ingredients make sense to me - it has really helped me to feel "at home" in a foreign place. excellent recipe! and just in time too i bought 3 packs of frozen headless sardines which was on sale from an asian grocery which i have no idea yet what to do. i will definiitely try this one. thanks and more power! I've been looking for some fish recipes but I have to ask, is this is healthy? The sugar and seems like high in sodium? I have an aesthetics question. I'm making these RIGHT NOW, and I can't wait to eat them- they're so delicious! But while I'm cooking the sardines (I think I have some large ones at my market) the bones start to poke out from the flesh, like the flesh is shrinking back while it's cooking to expose the skeleton. Doesn't make a difference to the taste, but it does look a bit less beautiful. I still eat them though. So delicious! That does tend to happen with sardines, but unless you remove the bones (necessary for some dishes) it's going to happen.